This is a picture from April 2015 with the kids having some fun! Lake Michigan Salmon fishing in 2017 should be good this year. Water temps appear to be up just a little and so far winter as not been too bad. We here at My Mistress Charters wish everyone a great 2017. Coho Salmon starts around mid March when the ice goes out allowing the pier head area for warmer water. 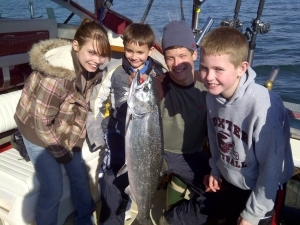 We are offering a $50.00 discount on all April and May 7 hour fishing trips booked by April 1st. While in St Joseph Michigan check out the Businesses downtown and the many attractions. for young and old . Please call 269 506 3513 or E-Mail us at mymistresstwo@ gmail.com. Happy New Year to all.